Take a bowl. 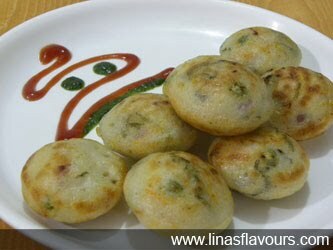 Add idli batter, tomatoes, onions, peas, green chillies, ginger, salt and mix it well. Grease appam maker with oil and put it on the gas stove. Pour about 2 tablespoon of mixture into each section. Cover and cook it for about 2-3 minutes till it turns light brown. Check it and flip it over on the other side. Cover and cook it for about 2-3 minutes on the other side also. Take it out and serve it with chutney. If you are making for small kids then change the proportion of green chillies as per the need. Serve it with your choice of chutneys.